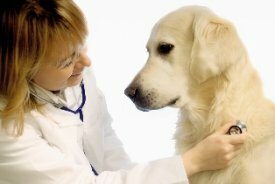 Is your pet on the mend from a recent injury or surgery? Is it struggling to get around these days due to chronic pain and inflammation from arthritis? Does it suffer from nerve damage or immune system impairment? If the answer to any of these questions is yes, then you should look into laser therapy to treat your pet's problems. Lasers have proven beneficial in treating animal ailments as well as human ones -- and now you have access to Toledo pet therapy laser service right here at Trilby Animal Hospital. What are lasers, anyway, and how do they help speed healing and maintain wellness? Laser stands for Light Amplification by Stimulated Emission of Radiation. A laser beam is merely a stream of photons emitted at a particular electromagnetic frequency. The lasers used by a veterinarian do not cut or burn -- in fact, your pet will experience something like an enjoyable massage. Underneath the skin, the laser is highly effective at stimulating cell activity. As Dr. Moore and staff apply the laser energy, cells respond with a spike in metabolism, resulting in faster and more efficient healing of injured or ailing muscles, nerves, bone and other tissues. The laser therapy also boosts the circulation at the treatment site, helping to reduce inflammation, swelling or fluid buildup in joints or soft tissues. The stimulant effect of laser therapy even extends to your pet's immune system response, an immense help to animals suffering from disorders that target or affect this critical factor in your pet's overall health and wellness. Our Toledo animal hospital uses the Companion Therapy Laser System. This system's advanced features include a high-power solid-state laser that produces more photons per emission than other therapeutic laser products, as well as a special laser probe that can apply greater power density over a larger treatment area. As a result, Dr. Moore, can deliver more of the healing laser power in a shorter amount of time while your pet remains completely safe and comfortable. Laser therapy can work wonders for pets suffering the normal side effects of the aging process, such as arthritis pain and stiffness. You might think your pet had stepped into a time machine and grown years younger as it regains its mobility and starts to enjoy a pain-free life once more. Owners of wounded or post-operative pets are gratified to know that the laser therapy is helping those wounds or incisions heal more rapidly. The laser's ability to boost your pet's healing capacity also helps resolve skin diseases and regeneration of damaged nerves. It can even contribute to your pet's ongoing wellness by helping to maintain a high level of immune resistance to common health threats. Contact our Toledo facility today to find out for yourself whether our pet therapy laser can help your pet!